Throughout these past few bitterly cold, pitch-black nights, as allegations that Beyoncé lip-synched the national anthem swirled, the only thing keeping up the spirits of all those true Beylievers in the Beyhive was this: Yes, there was some serious intel backing up the charge — most notably, comments from a spokesperson for the Marine Corps Band — but no one officially said she wasn’t really singing at the inauguration. Well, until now. On Wednesday, CNN got an inauguration official to weigh in, and the word is — “She did not sing live.” Ah, goddamnit. 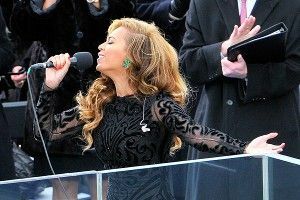 Well, then, there you have it, Beyhaters and anonymous inauguration official (anonymous, huh? Yeah, better stay that way, my dude): Beyoncé may have been lip-synching, but at least she’s incredible at that, too.